Is the Porsche Cayenne Coupe nearing its debut? With a near-production-ready specimen spied testing in Scandinavia, the international debut of the Cayenne Coupe seems imminent. In July 2018, we had brought you the first spy images of the Cayenne Coupe clicked by our international partner Quattroruote. 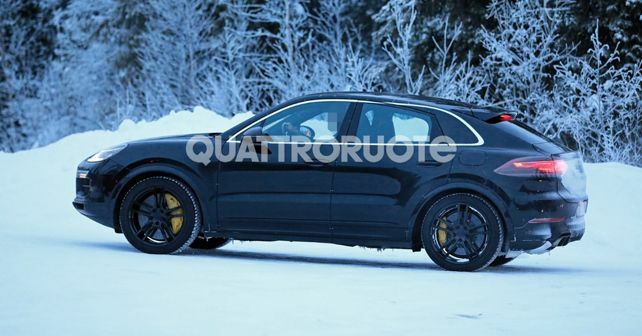 Now though, the car has been spotted testing once again, in the snowy region of Scandinavia. While the earlier images were of an early-stage prototype, the latest images seem to belong to a more production-ready version. Having said that, the Cayenne Coupe will be the latest entrant into the 'Coupe SUV' lineup as it will mark Porsche's debut in the space. It will be targetted as a direct rival to the BMW X6 and the Mercedes-AMG GLE 63 Coupe. The global demand for a coupe-styled SUV has been on the rise as manufacturers like Mercedes have also gone on to introduce the sloping-roofline versions of its GLC and GLE coupe models (which are available in India as well). Most recently, BMW launched a downsized version of the X6 in India, in the form of the new X4. As the 2018 Cayenne was the first generation of the SUV to be launched in India without a diesel powertrain, it seems the Cayenne model portfolio is all set to witness another first. Meanwhile, the Cayenne Coupe is immediately differentiated from the standard SUV by the virtue of its sloping Urus-like roofline. While this will result in rear headroom compromise, the coupe styling will definitely add a bit of boyish zest and flair to the otherwise elegant and sophisticated design. The spy shots also reveal similar front-end styling as the third-generation Cayenne, although the bumper design seems to have been altered a bit. Mirroring the strategy of its key rivals, Porsche has given the Cayenne Coupe a liftback-style tailgate while the altered rear side windows and a new tail-light design aim at a more sportier profile. At the moment, it is rumoured that the Cayenne Coupe will make its formal international debut in the last quarter of 2019. However, an official company statement on the exact launch date is still awaited. I will be interesting to see whether Porsche will bring the Cayenne Coupe to India, keeping in mind that the Cayenne has some serious fan following here.